My understanding of the ISO setting on digital cameras is that, unlike film-cameras, changing the ISO does not evoke any physical change in the camera. Rather, it simply tells the camera to multiply the analog-voltages it reads from the sensors by a constant number, which increases the brightness of that pixel in the output JPEG image. And since the RAW files store the actual voltages read, before any changes to the brightness take place, the values in the RAW file will be the same regardless of the ISO setting. Thus, if you're snapping pictures in RAW format only, the ISO setting does absolutely nothing (Also it would mean digital cameras with higher ISOs are completely a marketing gimmick). 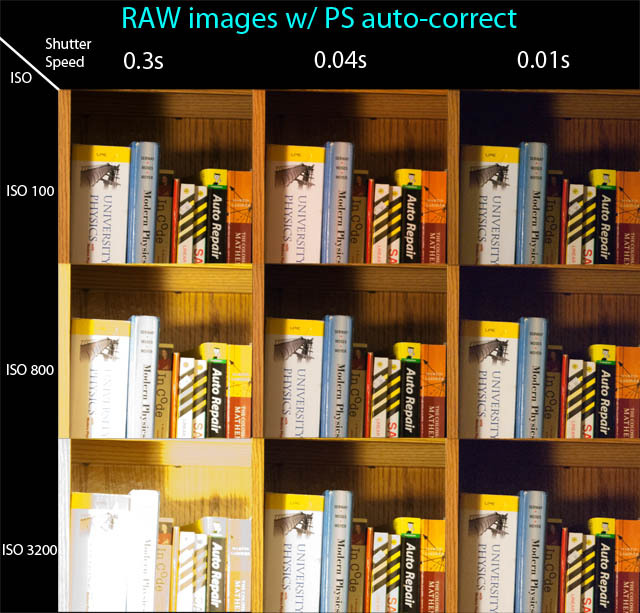 which claims that the ISO setting does affect the RAW output! † It also states "to minimise noise get as much light into the camera as possible then use the highest ISO you can without overexposing." To figure out which understanding is correct, I tried shooting an image at various ISOs and shutter-speeds, in RAW+JPEG mode. I then loaded the RAW files into Photoshop and applied auto-correct within "Camera Raw" (before the JPEG conversion). It appears we're both wrong (What!?!??!!?). The ISO setting definitely did have a major difference in the final RAW image, but it seems that even when it causes under-exposure, using the lowest ISO setting still resulted in the least amount of noise!! I assume that, to understand why that is, I need to know exactly how the ISO setting works in DLSRs - could someone please explain that to me? Is the sensor somehow physically made more sensitive, or is it a simple digital (or possibly analog) amplification of the voltage signal? Or does it work differently in different cameras (mine is a rather low-tier DLSR)? If the sensor doesn't physically become more sensitive, why does the ISO setting affect the RAW image? Why did an underexposed ISO100 image result in less noise (after photoshop correction) than the same image with the same aperture/shutter at (a correctly-exposed) ISO3200? It would be wrong to think that increasing ISO results in no "physical" change in the camera at all. The problem with ISO is that people often call it sensitivity. That is really a misnomer...sensitivity is a fixed attribute of any given sensor, and it cannot be changed. Sensitivity is really more synonymous with the quantum efficiency of the photodiodes, factoring in the percentage of light filtered out by the IR cutoff filter, low-passe filter, and color filter array. Generally speaking, most DSLR's these days actually have a 13-18% "sensitivity" to light...that means that only about 13-18% of the light that passes through the lens actually reaches the photodiode and actually releases an electron. Approximately 60% of light or more is filtered by the filter stack and CFA, and the quantum efficiency of photodiodes (the rate of photon strikes to electron release) in moderns sensors ranges from ~45% to ~60%. ISO is really just an instruction to the camera's electronics to change how the electronic charge, the analog signal, stored in the sensor is amplified to produce a proper exposure. In that sense, there IS a "physical" change in what is actually happening to the image signal within the electronics of the sensor. A certain gain is applied to the original signal in the sensor upon readout. Increasing ISO changes this gain, resulting in greater and greater amplification of the signal. Your question is, does increasing ISO matter, and does changing ISO affect the RAW? The answer is YES and YES! If you shot everything at ISO 100, and changed "amplification" digitally in post, then your images will be much noisier than if you use the most appropriate setting in your camera. The mechanisms of amplifying the image signal performed by the camera are vastly superior to your basic digital ISO boost with some kind of post processing tool like Lightroom. The sample image from Matt Grum that you referenced from the original post should be an ideal example of that. 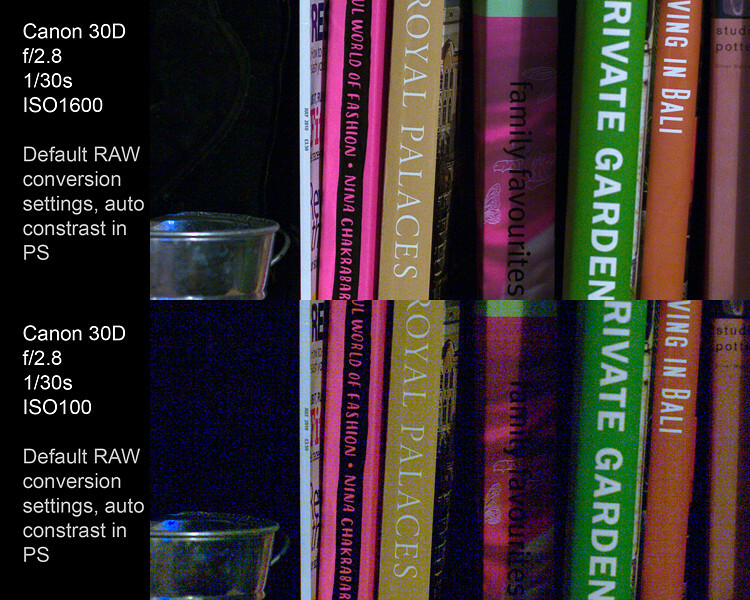 Notice how much worse the noise in the digitally boosted ISO 100 image is than the ISO 1600 image? There is a lot of blue color noise, banding patterns are starting to show up, and there is a loss of detail. The camera did a much better job when it was told to use ISO 1600...there is less noise, more detail, sharper detail. The reason boosting ISO in-camera is better is it works with the original, native signal right off the sensor before any downstream electronics have a chance to introduce additional noise. In a CMOS Image Sensor (CIS), each and every pixel has built-in noise reduction circuitry (CDS, correlated double sampling...this measures the dark-current charge in the pixel at "reset time", and memorizes it so it can be subtracted at readout) as well as a built-in amplifier. When each column of pixels is read out, the charge of the pixel is first denoised by the CDS circuitry, and that "clean" charge is then directly amplified before being sent to the readout circuitry sent off-die. Analog-to-Digital Conversion, or ADC, occurs off the sensor die in a DSP chip in most cameras (there are some exceptions, more in a moment). ADCs are usually moderately parallel, there may be eight, sixteen, maybe more in a given camera. Despite being parallel, each one must still process hundreds of thousands if not millions of pixels in a fraction of a second. That requires a high operating frequency, which has the tendency to introduce additional noise. 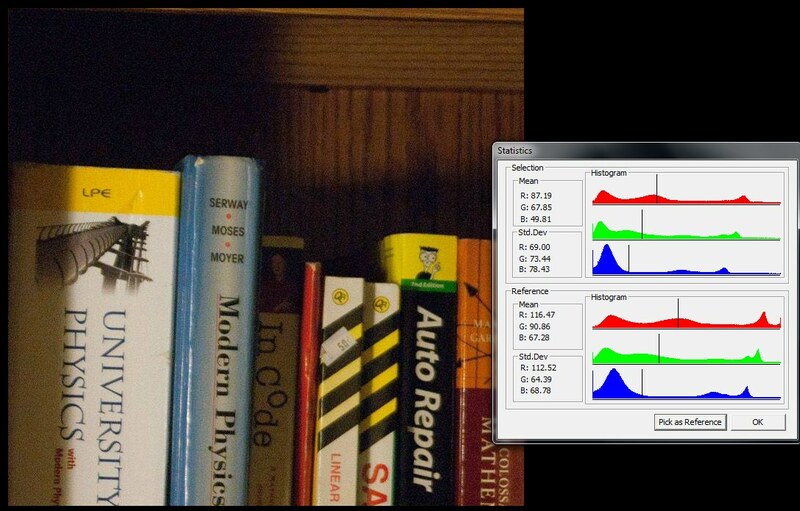 This is the primary source of color and banding noise in most DSLRs that exhibit such. The ISO 100 image that was boosted in post is also boosting this additional post-read noise that is introduced downstream from the sensor. By increasing ISO in-camera, you amplify the image signal directly, and any additional downstream contributors to noise only affect the lower end of the signal. This preserves the image to electronic noise signal ratio. There is an additional contributor to noise that has nothing to do with the electronics. The random nature of light itself results in a Poisson distribution of photon strikes. With less total light striking the sensor, Poisson noise will be higher. If you had a noiseless sensor, one which did not introduce any electronic noise of it's own at all...then using ISO 1600 would be the same as using ISO 100 and boosting the exposure by four stops in post. The amount of noise in the two images would be identical, and it would all be noise that results from the random physical nature of light. There is one sensor on the market today that is nearly noiseless. The Sony Exmor sensor uses a highly advanced, column-parallel, ON-DIE Digital ADC/CDS readout design. Unlike most sensors, which maintain an analog signal throughout a pipeline from sensor to DSP (until just after ADC), Exmor performs both CDS and ADC on-die, and in a digital manner. Rather than each pixel having analog CDS circuitry to measure dark current per-pixel, Exmor performs a reset-read, that reset read is immediately converted into digital, and stores the entire sensors "dark current" charge in a virtual image of negative values. When an exposure is made, the image signal is read out, converted into digital, and the negative reset image is applied to the positive exposure image. Since there is one ADC per column in Exmor, rather than one ADC per dozens of columns, they can operate at a lower frequency. Between using digital CDS, per-column ADC, and lower frequency components, Exmor introduces nearly zero noise, does not introduce any visible banding or pattern noise, and for all intents and purposes could be considered a "noiseless" sensor. There is still some noise, and sufficiently boosting an exposure in post will ultimately result in that noise becoming visible. One could, however, take a photo at ISO 100, lift it by four stops, and have it look just about as good as a photo taken at ISO 1600. As a matter of fact, in the case of Exmor...that is EXACTLY the case! All "amplification" in Exmor is digital by nature, although the sensor electronics tend to be better at it than manually lifting exposure in post, by a small margin. It is also important to realize that the increase in ISO itself does not actually add noise itself. ISO is not a source of noise! Assuming a noiseless sensor, if you expose a static scene such that you achieve a proper exposure at ISO 100, and expose the same static scene such that you achieve a proper exposure at ISO 3200, the latter will have more noise. Why, you ask? Poisson noise, more commonly called Photon Shot noise, or noise caused by the random nature of light, is the cause. In the properly-exposed ISO 100 image, you are either using a wider aperture, using a longer shutter, or both. Let's assume for the sake of discussion we are only changing shutter speed, to maintain DOF and get exactly the same scene at both ISO 100 and ISO 3200. The difference in shutter speed is five stops. That is a thirty-two fold difference in the amount of light at the sensor! The more light you have, the less photon shot noise will be apparent...the signal-to-noise ratio (SNR) of the image to it's own natural noise is higher with a properly exposed ISO 100 image, and much lower with a properly exposed ISO 3200 image. If we use the Nikon D800 (which uses a Sony Exmor sensor), shooting an image underexposed by five stops at ISO 100, and another properly exposed at ISO 3200, and amplify the ISO 100 image, it will be ever so slightly noisier than the ISO 3200 image. It effectively has the same SNR relative to photon shot noise, and will have a very small contribution of read noise as well that will get amplified along with the rest of the image. Well, you asked to know exactly how ISO worked in a modern digital camera. This is not a complete explanation, and different manufacturers handle certain high ISO settings differently. For example, Canon sensors will only amplify the image signal directly off the sensor up to a certain point, and will then use an additional downstream amplifier between the sensor and the ADC to achieve the top couple of stops (i.e. in a camera that goes to ISO 6400, ISO 1600 is the max "natively amplified" setting, and ISO 3200 and 6400 involve an additional downstream, but still analog, amplification.) "Expanded ISO" settings are also special on most cameras in that all they really are is a digital boost. So any setting called HI, or H1, H2, etc., is not a true ISO setting...it is a fake ISO setting. You could achieve similar or better results by underexposing in RAW at the maximum real ISO setting, and performing the same exposure boost in post. Changing the ISO setting does invoke a change in the camera, it alters the on chip amplification. The voltages produced by incoming light are amplified prior to digitization. The reason for this is that the analogue signal picks up noise on its way to the ADC (analogue to digital converter). By amplifying a weak signal first, the effects of this noise are reduced compared to digitizing the weak signal and then applying the amplification mathematically to the digitized values (which is what Photoshop is doing in your example), as this amplifies the read noise. The reason you don't experience the same effect using your Sony a390 is that model features Sony patented technology designed to dramatically reduce the build up of read noise on the way to the ADC. The only advantage to using the ISO setting in camera is to reduce the quantization noise that can arise if there aren't enough digital values to represent small changes in a weak signal. Apart from that the ISO is near redundant (or worse it's counter-productive as if the metering is incorrect a high ISO image may clip whereas a low ISO image would not). Sensors cannot be made more or less sensitive. They simply respond to photos by freeing an electrical charge which is accumulated per photosite. That charge is an analog quantity. Technically, it discrete at the atomic level but is treated as an analog value. When ISO is set on camera what changes is the saturation point which gets mapped to the highest possible digital value. Lower charges get mapped proportionally by the A/D converter which is why you still get the same bit-depth per-pixel at all normal ISO. As opposed to expanded ISO which are most often processed digitally. RAW output is records the digital values and is therefore affected by ISO. If you multiple the signal digitally to emulate ISO, you will lose bit-depth and multiple any noise present in the analog signal. I believe your assumption is incorrect. Though perhaps in some cameras there might be a fixed gain and the ISO is purely digital filtering (which could be done offline just as easily), I believe that on many cameras, the ISO setting actually controls the analog gain of the detector. Higher ISO is not desirable, because more gain means more noise. In any analog amplification system, gain staging is important to get the best signal. 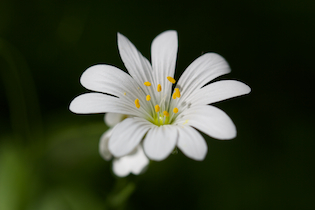 In the photographic system, our first gain is the light gathering power of the lens. The second gain is the sensitivity of the film, or actual electronic gain of the detector, as the case may be. The least noisy results are obtained if you let in enough light and use only moderate gain. Using more gain (higher ISO) in the detector is a "necessary evil" for low light conditions or when short exposures are needed to eliminate motion blur, or low aperture is needed for depth of field. I.e. choice of ISO is basically driven by the other parameters: available light/aperture, and shutter speed. And since the RAW files store the actual voltages read, before any changes to the brightness take place, the values in the RAW file will be the same regardless of the ISO setting. This assumption is incorrect. ISO settings in digital cameras change the amount of amplification of the analog voltage from each sensel (pixel well) before the signal is read out, much less converted to digital information. What is recorded in raw files are the values of the amplified analog signal converted to digital information. The reason for this is that there is additional noise added by the electronic pathways between the sensor and the digital-to-analog converter (DAC). If the analog voltages from each sensel are not amplified before being read out, they would be so weak that the 'dark current' noise added by the path between the sensor and the DAC would overwhelm all but the strongest of signals (e.g. anything except images that were captured in very bright light and/or for very long time periods). Thus, if you're snapping pictures in RAW format only, the ISO setting does absolutely nothing (Also it would mean digital cameras with higher ISOs are completely a marketing gimmick). Since your original premise, quoted above, is incorrect it follows that the conclusion based on that incorrect premise is equally incorrect. What is converted by the ADC and recorded in the raw image data is materially affected by the on-die amplification of the analog voltage from each sensel. The advice in the answer referenced at the beginning of the question is to be understood as "... let enough light into the camera and then use the highest ISO value that doesn't result in blown highlights. If enough light is let into the camera, that ideal ISO could well be the camera's minimum ISO setting. Only when we are limited by the amount of available light, the camera's maximum aperture width/the aperture setting needed to get a desired depth of field, or the shutter time needed to prevent blurring a moving subject does the advice to increase ISO to the highest setting that does not overexpose the highlights become applicable to an ISO setting higher than the camera's baseline ISO. Although not incorrect per se, the statement in that answer is confusing. The answer is not comparing noise at different ISO settings, it's comparing the difference between analog and digital amplification. Setting a higher ISO uses analog amplification, so that performs better than under exposing the image and compensating in post processing, as that uses digital amplification. If you want to minimise noise you should use the lowest possible ISO setting. You should only use a higher ISO setting if you need it to get a correct exposure, when you can't get more light into the camera. In order to minimize noise, you want as much light as possible on the sensor, subject to (1) not clipping highlights in which you want to preserve detail, (2) setting aperture for your desired depth of field and (3) setting shutter speed for your desired motion blur (subject and camera) or lack of motion blur. Will increasing ISO help if you do the foregoing and are still below clipping desired highlights? If increasing ISO decreases read noise, it can help. It depends on the sensor in your camera. In some sensors you get less read noise if you increase ISO, at least up to a point. In other sensor (sometimes called ISO-less), read noise does not increase with ISO. This assumes you are shooting raw. Before I accept an answer, I just wanted to add a summary of what I've learned from all these great answers and several other sources. I've seen several users recommend "using the highest ISO you can without overexposing," without any additional explanation or qualifiers, which is completely wrong. I am making it community-wiki, so feel free to add to it or correct any mistakes. Using the lowest ISO (for a given exposure, meaning you'd have to change either the aperture or shutter speed as well) will always give you the least noise; however, it will not always give you the best picture. For example, having a slow shutter speed at ISO 100 might cause the image to be a bit blurry, while having a faster shutter speed at ISO 400, despite having more noise, might look better due to lack of blur (and the noise might not even be visible). There's no good rule to know when this will be the case. You should experiment a lot to gain this intuition. ISO values that aren't some-power-of-2 * 100 might be an exception to this rule, possibly being preferred over lower ISO values. See for example here. Contrary to this answer, all other settings being equal, and with no clipping, all ISO settings will be nearly equivalent in terms of the auto-corrected RAW image. The difference is that the lower ISO setting will have less-contrast/quantization-noise, due to losing information (because the exposure correction is done digitally, rather than analog), but will actually tend to have slightly less overall noise, because the amplifiers used by the higher ISO's create some noise, and because higher ISO's are more sensitive to shot noise. This is exactly what I observed in the images in the question. If either the aperture size or the shutter speed are flexible for the shot you want to take (ie. won't cause blur, won't compromise your artistic vision, etc), use the combination that allows you to have the lowest ISO possible, while still having the proper exposure, to minimize noise. If either the aperture size or the shutter speed are flexible for the shot you want to take (ie. won't cause blur, won't compromise your artistic vision, etc), use the combination that results in the most light on the sensor, so long as you are not clipping highlights in which you want to preserve detail. If the aperture size and shutter speed are both rigid and unchangeable, choose the ISO that provides the proper exposure to minimize noise. This might not always be possible. If you have to choose between a lower ISO that is under-exposed and a higher ISO that is over-exposed, it's generally better to choose the higher ISO and fix the exposure in post. If the aperture size and shutter speed are both rigid and unchangeable, choose the ISO that provides results in the lowest read noise, so long as you are not clipping highlights in which you wish to preserve detail, and adjust brightness in post. The values from the camera's sensors are analog, but need to be converted to digital to be used by a computer. Any amplification of these values must be done before the analog-digital conversion, to avoid losing information (quantization noise). The ISO setting in the camera controls how much analog amplification is done. This is why the ISO setting affects the RAW output. The "Auto-ISO" setting on many cameras will not go above a certain ISO (to avoid noise), even if that ISO is necessary for a proper exposure. In those cases, you'll have to set the ISO manually. The exposure meter is not always correct, so finding the correct exposure might require some experimentation. Images are sometimes intentionally over-exposed, to reduce the noise and get as much useful bit-depth as possible from the RAW output file. This is called Expose To The Right (ETTR) (See also). In this case, all the above Cheat-Sheet rules still apply; just replace the phrase "proper exposure" with "highest non-clipping overexposure." Overexposing too much will cause the values to be clipped (maxed because they're higher than the sensor can handle). This is why the ISO 800 and ISO 3200 shots on the left of the image in the question could not be restored. I've been looking at the issue that you see more noise in the High ISO show than the Iso 100 shot even though everyone is telling you that is should be opposite. People are telling you why it should be opposite and Jrista told you why the effect is not as apparent with your camera as with e.g. Canon cameras (near equal). But your notice that it seemed to be less noise in post-boosted iso 100 and not equal or more noise still stands. I went ahead looking into your result. The conclusion by the original Matt demonstration assumes that the end result is the same image from the same conditions, where you then raise ISO vs raise Exposure in post to properly expose. I.e. same brightness @ the same incoming light. So I compare your 0.01s row iso 100 vs iso 3200 histogram and found you did not raise the iso 100 as much as the iso 3200. there's around 40% difference. 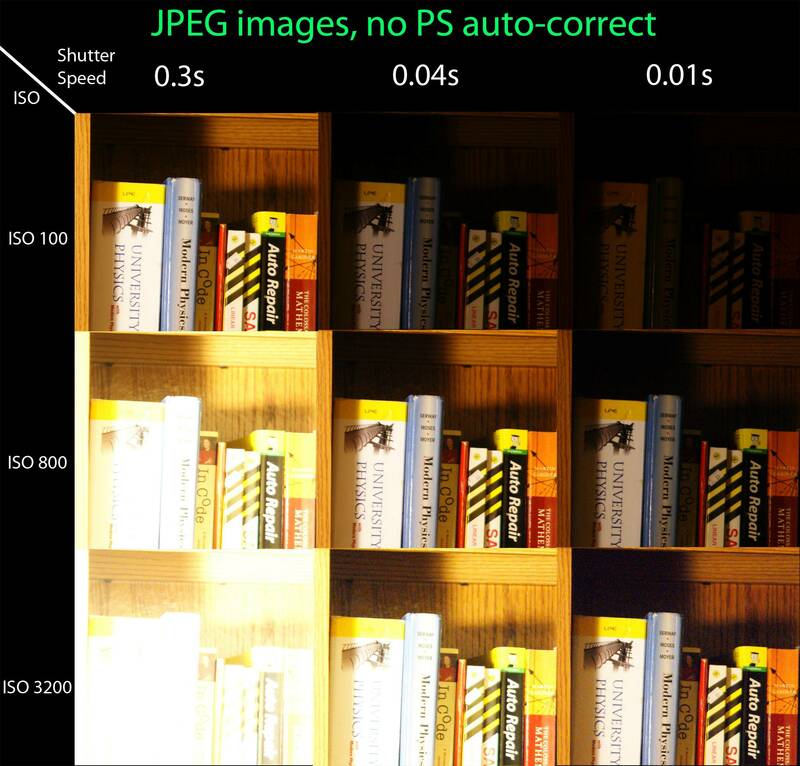 Now it looks pretty equal if you look at the power of the noise, so Jrista is right about your near perfect sensor. Perhaps the textures in the dark is a bit better with iso 3200, and the bluish grains seem larger, but it's hard to conclude the quality of noise in these web converted images. we need to see the results on the raws. A very quick answer: raising the iso setting you are applying a greater gain to the signal. This means that you are multiplying in an "analogue" way (amplifying a current) and not in a "digital" way, (multiplying a number by 2, by 4.... and so on, which would correspond to your mental model). In the last years a term is gaining in popularity (I don't think it is particularly well chosen) which describes a sensor which works like you imagine, and it is "isoless camera". Not the answer you're looking for? Browse other questions tagged digital iso digital-vs-film iso-noise digital-iso or ask your own question. When to use high iso and a short shutter time and vice versa? What does “expanded ISO” mean? What are the advantages and disadvantages of using auto ISO on a DSLR?